The budget segment is where Xiaomi competes most fiercely. The company's latest offering is the Redmi Go, which was launched in India on Tuesday. Priced at Rs. 4,499, the Redmi Go is targeted at first-time smartphone users and offers a pure Android experience with Android 8.1 Oreo (Go Edition). It will be up for grabs starting Friday and will be available on Flipkart and Mi.com, and at Mi Home stores across the country. We got a little hands-on time with the Redmi Go at the launch event, and here are our first impressions. The new Redmi Go is compact and feels surprisingly sturdy for a plastic smartphone in this price range. Measuring in at 140.4x70.1x8.35 mm, the Redmi Go fits well in the hand and offers a nice grip. It has comfortable curved edges and tips the scales at just 137g. The Redmi Go packs a 5-inch HD (720x1280 pixels) display with 16:9 aspect ratio, which isn't very common anymore. The display looked vibrant indoors, but we noticed washed out colours under daylight. The bottom bezel features the capacitive Android navigation buttons and is quite thick, which is also the case with the top bezel. The Redmi Go might not look very modern, but this is fine for such a low-cost phone. The Redmi Go is made out of plastic, but it is quite stiff and we did not feel any flex in the back panel. The latest entry-level offering from Xiaomi comes in Blue and Black colour options, with the former flaunting a subtle glossy finish while the latter has an understated matte texture. The matte surface finish on the Black variant does a good job at keeping fingerprint marks and smudges at bay — as opposed to shiny plastic and glass, which pick up dust and smudges quickly. The top of this phone has the 3.5mm audio jack and a microphone hole, while a Micro-USB port, speaker, and second microphone hole are at the bottom. The power button and the volume rocker are located on the right and provide a nice, clicky feedback. The Redmi Go features two trays on the left — the upper one accommodates a single Nano-SIM, while the one below it can house another SIM and a microSD card of up to 128GB capacity. Xiaomi claims that there are dual pyrolytic graphite sheets beneath the plastic casing that evenly diffuse heat from the internal components and keep the smartphone cool. The Redmi Go is powered by the Qualcomm Snapdragon 425 processor paired with a paltry 1GB of RAM and 8GB of internal storage. A 3,000mAh battery keeps the lights on. There is a single 8-megapixel camera with an f/2.0 aperture on the rear, and a 5-megapixel front camera on the front to take care of selfies. The Redmi Go runs Android 8.1 Oreo (Go Edition) and comes with a number of preinstalled apps in their ‘Lite' avatars to work well with such low-end hardware. The performance of the Redmi Go appeared to be zippy, and apps loaded quickly in our brief experience. However, we'll reserve a final opinion for our in-depth review, after we thoroughly assess parameters including camera quality, performance, display quality, and battery life, among others. Stay tuned to Gadgets 360 for our Redmi Go review, coming up soon. Can Redmi Go Be the affordable smartphone that kills feature phones? We discussed this on Orbital, our weekly technology podcast, which you can subscribe to via Apple Podcasts or RSS, download the episode, or just hit the play button below. 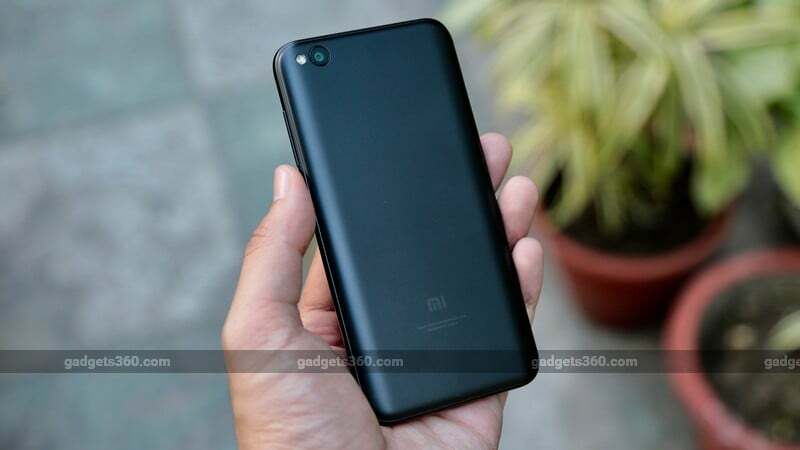 product Redmi Go is Xiaomi's latest entry-level offering and offers a sturdy build and clean Android experience at a price point in India of Rs. 4,499.